communications between the affected service and clients. 3.0 or TLS 1.0 instead. The remote service supports the use of medium strength SSL ciphers. lengths at least 56 bits and less than 112 bits. The remote service supports the use of weak SSL ciphers. encryption or no encryption at all. How to verify the changes? Now that you have made these changes how can you be sure that they have taken place without having to go to your boss or higher authority just to find that you did them wrong. Well I found a nice tool called SSL-SCAN which you can download at http://code.google.com/p/sslscan-win/ for the Windows port or you can download an compile for your favorite operating system at the original project SSL-SCAN site http://sourceforge.net/projects/sslscan/. This tool provides some great detail about what is allows and not allows plus some analysis of the SSL certificate itself. 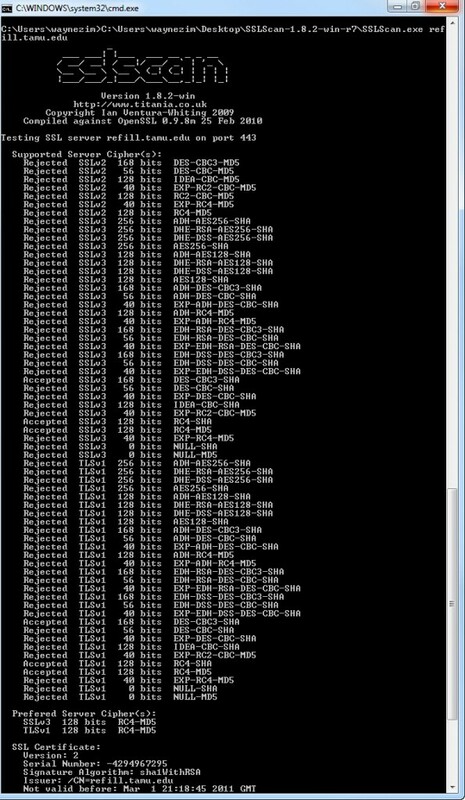 Below the screen shot shows that we have disabled any ciphers that attempt to use the SSL 2.0 protocol and we’ve disabled all ciphers that less than 128bit. Thanks, very helpful and perfect article in understanding this you really helped. Nicely explained. Verification bit was an added bonus. Great article, saved my valuable time, thanks. Thanks for this article, very much appreciated! Thanks.. I did this changes in the registry.. the changes take effect immediately.. no need to restart the server. Wayne, you hit subject right on. Short, informative and with solution! Great write up! I was looking specifically for this information to remediate vulnerabilities related to SSL and cipher suites in my org. Many thanks Wayne!! Billiant article – I have been pulling my hair out on this one for a week, slogging through microsoft articles that clearly don’t explain the problem or the fix fully, or any tools to help check the fix is working – and this is, what, nearly 5 years after your post and the internet is still as bad! Thanks!